Here you can shop all our LARP weapons by type. Whether you are looking for a specific weapon style or want an organized way to browse everything LARP, shop all our LARP weapons sorted by type here. We carry an incredible selection of LARP weapons of all types, including swords, daggers, shields, pole weapons, axes, maces, hammers, bows, and more. 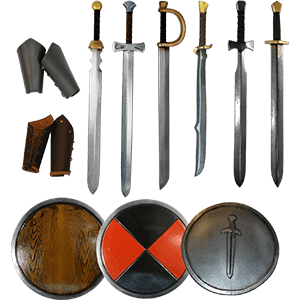 Here you will even find LARP packages great for getting everything you need in one easy set. Our LARP maintenance and DIY items are must-haves when it comes to making sure your LARP gear is in top shape or for constructing your own unique LARP weapon. If you are a fighter who utilizes as specific style of weapon, like an archer or a swordfighter, and you need a weapon to match that, our Shop by LARP Weapon Type is perfect. Start your search for your ideal LARP weapon here. Now that you have an LARP shield and LARP leather armour for protection, you should have a good and durable LARP sword. All our LARP swords are very affordable and the best on the LARP market. We carry LARP swords that include claymore swords, short swords, long swords, LARP Knight swords, Paladin Swords, and LARP medieval swords. We have LARP swords with dark designs like demons and skulls and some with intricate designs like Celtic and Elven scripts. Many of our LARP swords come in a variety of sizes to best suit your needs. All LARP swords have fiber capped core wrapped in latex foam and finish by authentic color shadings. These LARP swords look very real to medieval swords but safe enough to be used by children and practiced with during reenactments. A LARP sword always needs a LARP dagger for close quarter attacks during that LARP event or reenactment. 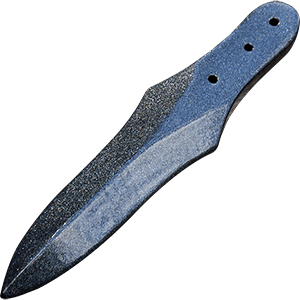 We have the best quality LARP daggers from the top manufacturers around the world. 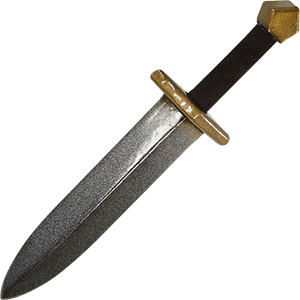 We have both medieval daggers and fantasy daggers from all the LARP collections at affordable prices. Our LARP daggers are great for kids to pretend they have swords and are very safe. All our LARP daggers have a capped core to prevent tearing, splitting, punch-through of the foam. These LARP Daggers are well suited for use in practice for martial arts, re-enactments, fairs, LARP Events and stage props. 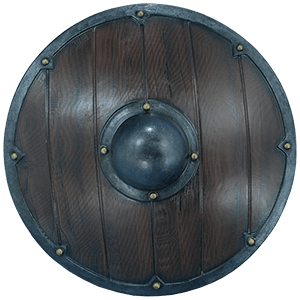 Looking for a LARP shield to protect yourself during a Live Action Roleplaying event. We now has more LARP shields than anyone in the USA. Our LARP shields come in a variety of shapes that include, round LARP shields, Oval LARP shields, medieval styled LARP shields and rectangular LARP shields. All our LARP shields come with intricate designs like Celtic dogs, Elven designs, skulls and demons, are on the face of them. These LARP Shields are well suited for use in practice for theatrical plays, re-enactments, fairs, LARP Events and stage props. Enjoy our wide selection of new LARP Shields to fit your needs. Our LARP Throwing Weapons are great for those moments in battle when you just cannot get within a swords reach of your enemy. Never fear, you came prepared, right? If not, you had better pick up some of our handy throwing knives. They are inexpensive and come in handy when you need them the most. Our throwing weapons are made from durable closed cell foam that does not shred and are heavily coated with silicone. None of them have a core, so they are very safe. We also offer foam bakers rolls, oversize tankards and elemental balls for spell casting. These are wonderful and unique items that can be used as weapons or as props. We also offer holders for some of our throwing knifes so you can carry one, three or five at a time. We now has new pole weapons and staffs to bring to the U.S. LARP market. Our LARP pole weapons are Swiss halberds, German halberds, spears, and gleve. These LARP pole weapons are great to penetrate battle lines and our making a great defense. We also have new LARP staffs, LARP quarter staffs, and long staffs for wizards and sorcerers at Live Action Roleplaying events and Medieval reenactments. Our LARP pole weapons and staffs are made of latex foam and like very real compared to the ones used during Medieval Times. Looking for a good quality and durable LARP axe? 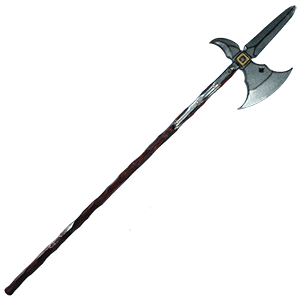 We carries several types of LARP axes such has single headed axes and double headed axes. We have long axes, short axes, medieval axes and fantasy axes that will strike fear in your LARP opponent. 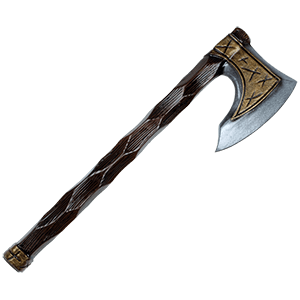 Axes in the Medieval Era were used to pierce armor and break open helms. We have LARP axes with intricate ornate designs while others have skulls, snakes and devils on them. We are your number one source for live action roleplaying axes at affordable prices. We have the biggest selection of LARP hammers available on the internet. 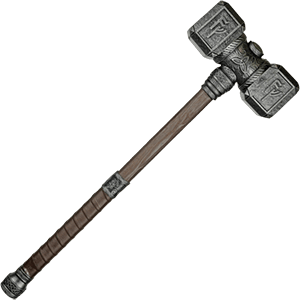 We have double sided hammers, single sided hammer, pick hammers, mercenary hammers and medieval hammers. With our double sides LARP hammers you can swing in any direction to strike your opponent. Smash through your enemies armour or pick your opponents apart with these quality and durable LARP hammers. Our LARP pick hammers feature a hammer on one side and a long large spike on the other. Our LARP hammers are perfect for LARP events, LRP, re-enactments, practice or plays. 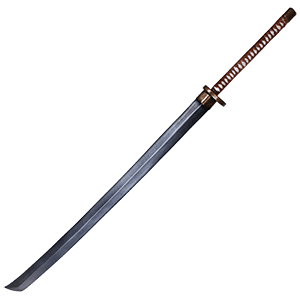 We carry several styles and types of LARP oriental swords. Our LARP oriental swords include katanas, tantos, wakizashis and naginata from top manufacturers around the world. Our LARP Naginata is 63 inches long! These LARP oriental weapons and swords come most from the Elven collection as well as the imperial collection. Our LARP oriental swords are beautiful and will last on average 1 to 2 years of use without mistreatment. These are great if you have a Japanese or oriental base character that you are dress up to be. You'll find nothing but legendary blades if you take a peek into the LOTR LARP section. These are not mundane weapons but epic blades of unmatched quality, all converted into LARP weapons so that others might experience the power of the Fellowship and their impressive and powerful weapons for themselves. Each and every weapon you'll find here is based on the corresponding arms that can be found in one of the three Lord of the Rings movies. They're all incredibly detailed, featuring even the most subtle of features, including Elfish script and subtle flairs that perfectly identify each weapon. Each and every weapon you'll find in this category, be it a sword or an axe, is a quality LARP weapon that has been made from quality materials, including layers of tough foam and an outer coating of durable latex, while also featuring a superior balance and grip that allows for skillful and comfortable use for hours of play. 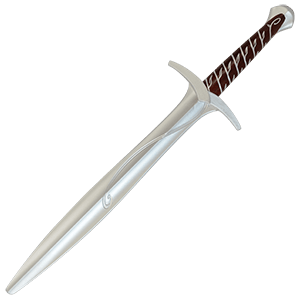 Glamdring, Anduril, and Sting are all swords you can hope to find in here, as well as others that called the lands of Middle Earth home for a time. You may not wield the power of the One Ring, but any of these LOTR LARP weapons will ensure that your foes fall before you droves as you wield the mythic power of some of the most powerful weapons ever wielded by Man, Elf, Dwarf, Hobbit, Orc, and Uruk-hai. Whether you are a role-playing novice or an experienced LARPer, you can find a great deal on your LARP weaponry and gear. We provide a number of excellent LARP Packages for Beginner, Intermediate, and Advanced skill levels, as well as affordable Ready for Battle options. Many of our LARP kits include a combination of items like a sword, shield, belt, frog, bracers, and maintenance silicone spray. Certain pieces allow you to choose your preferred color or style option. In addition to swords, we also offer LARP archery packages for those who enjoy ranged weaponry. These LARP gear bundles serve as a great starting point or special deal for anyone planning out their next role-playing ensemble! LARP is gaining ground in the USA and is becoming more and more popular with time. Some games may not have been introduced to LARP Archery or maybe have not tried it yet. Our LARP Bows can be a fun addition to any game and introduce new plots or possibilities making the overall experience for players very nice. Most of the LARP bows are made of fiberglass, some are covered in suede and some even have real wood tips. These LARP bows feature a low draw weight of 24-26 pounds which is the perfect draw weight for gaming. They will shoot our LARP arrows very nicely and are quite safe when used responsibly. 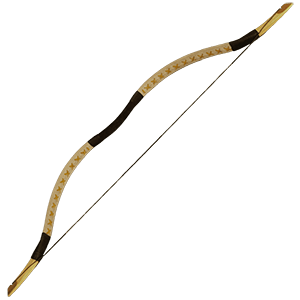 There is little to no maintenance with fiberglass LARP bows, and if you're not really into LARPing, but like the look of these bows, you can still use them for regular target shooting. They'll work fine with our traditional arrows as well. For the LARP Archer, we are pleased to offer our LARP arrows. These arrows have a foam head making them safe for use in LARP. We have styles that have a rounded tip or a flat tip and we also have crossbow bolts too. 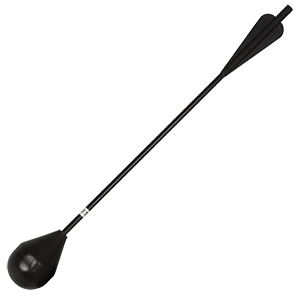 The LARP arrows can be used on bows with maximum draw weight and draw length of 30# at 28". The crossbow bolts can be used on crossbows with maximum draw weight and draw length of 30# at 15". They feature a high grade epoxy-glass resin shaft that is highly flexible, shatter proof and provides maximum accuracy. The arrows are capable of shooting up to 150 feet. These arrows are sold individually so you do not have to buy a whole dozen if you don't need it. Check with your local organizations for approval of use. Some of the arrows are available with different color fletching. Your LARP latex weapons will need regular maintenance and this silicone spray which is 100% pure and acid free is the perfect way to keep your weapons in good shape. The silicone will keep the coating flexible, protect it from drying out and helps the weapon resist wear and tear which will make the weapons last much longer. To use: spray the silicone directly on your latex weapon and work it in on the entire surface. Do not spray on leather handles and other non-latex areas, like hard plastic handles, etc. You can never use too much silicone, the more you use the better protected your latex weapon will be. If you regularly use your LARP weapon everyday or every weekend, we recommend coating your weapon weekly. If you only occasionally use your weapon a couple times a month, then monthly should be fine. Remember, the more you use silicone spray, the better your weapon is protected from aging. Sometimes, you need more than just weapons and armor when LARPing. And for those occasions, We have a selection of LARP Props, ranging from macabre battle trophies to curious little animals to full-sized creature props, all to suit your LARP Prop needs. Here, you'll find all manner of items that could find their way onto a battlefield or into a Live Action Role Play that focuses just as much on character development as it does on raw combat. Whether a wizard is looking for a familiar or a warrior is looking for a companion, you can find them here in the form of a variety of prop animals. Or perhaps a warrior needs something more grisly and gruesome, like the severed head of a slain enemy. Well, you can find those, and other body parts, here too. Whether your LARP is horror themed or just a tad on the visceral side, you'll find all manner of strange, impressive, and down-right awesome LARP Props that can be added to your next LARP adventure to make it really stand out and excel. When zombies invade your LARP, will you be ready to fight them off? As long as you're wielding one of our LARP Zombie Weapons you will be! 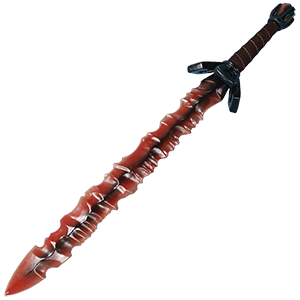 We are now offering a full line of impressive zombie-slaying weapons that will make short work of any zombies you encounter! Whether your tool of choice for zombie defense happens to be as simple as a common tool like a wrench or a sledge hammer, or something a little bit more techno-infused like a vibro sword, you can find it here! 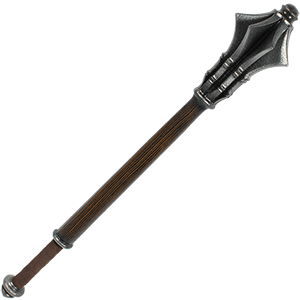 Of course, many of these weapons could also wind up in the hands of a zombie, making them doubly effective against any survivors that a zombie might encounter as well. 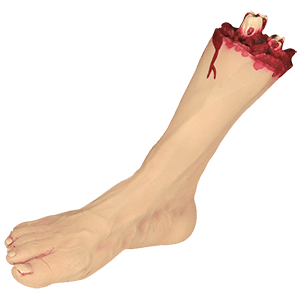 You'll even find a few zombie limbs and organs here, which double as mobile zombie snacks, as well as effective weapons! And the best part is that as realistic as these zombie LARP weapons look, they're all perfectly safe for use in LARPS, reenactments, and even by children. 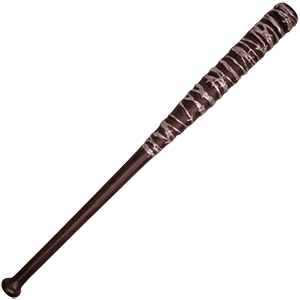 So the next time zombies step into your Live Action Role Play, make sure you turn to us to provide you with the Zombie LARP Weapons you need to not only equip that zombie horde, but also battle it like a real band of zombie apocalypse survivors!